Which Feosol® Iron is Right for You? 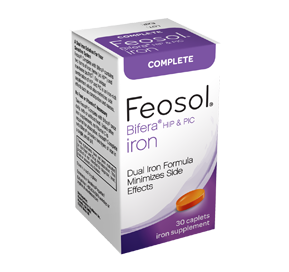 Feosol® Complete with Bifera® is a patented formula that contains two forms of iron: heme and non-heme. Heme iron is animal-based, like the iron in steak. Non-heme iron includes plant-derived iron, like the kind you find in spinach. The presence of a heme-based iron enhances iron absorption, while our unique combination of iron minimizes side effects such as constipation and nausea – delivering the best of both worlds. One Daily, Any Time of Day. One pill does it all. 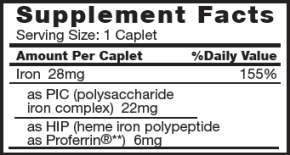 Take Feosol® Complete once daily, with or without food – no vitamin C required since absorption is enhanced when the heme form of iron is present. Unlike other iron supplements, Feosol® Complete with Bifera® provides both heme and non-heme in a single, small pill, so you have the flexibility to take it whenever you want. Microcrystalline cellulose, Dibasic calcium phosphate dihydrate, croscarmellose sodium, stearic acid, magnesium stearate, sucrose, protease, polyvinyl alcohol, polyethylene glycol, talc, FD&C yellow #6 aluminum lake, titanium dioxide, FD&C red #40 aluminum lake. **Proferrin® is a registered trademark of Colorado Biolabs, Frederick, CO.
One caplet daily with or without food, or as directed by a physician. Children under 12 years old should consult a physician. Do not exceed recommended dosage. Iron may interfere with absorption of certain antibiotics; these products should not be taken within two hours of each other. which iron is right for me? If you are a healthcare professional, please click on the Continue button. If you are not, click Cancel. &COPY; 2018 Meda Consumer Healthcare Inc. All Rights Reserved.